Following the reverse grid draw the top ten finishers from race two had their positions reversed for the 3rd BTCC race from Knockhill. 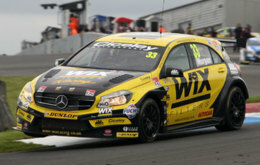 Adam Morgan started in pole position in his WIX Racing Mercedes Benz A-Class alongside Scottish racer Aiden Moffat in his Laser Tools Racing Mercedes Benz A-Class. The 2nd row of the grid was taken by Matt Neal and Jason Plato with Rob Austin and Andy Priaulx on row 3. Andrew Jordan and Mat Jackson started on row 4 with Rob Collard and local hero Gordon Shedden on row 5 completing the top 10 starters. With the news that Exocet AlcoSense driver Hunter Abbott's wife had given birth to their first child, the lights went out and the final race of the day got under way. 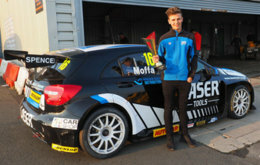 Both the Mercedes Benz A-Class drivers got a good start with Adam Morgan and Aiden Moffat extending a gap over Matt Neal in 3rd who was in turn defending from the advances of Jason Plato in the Team BMR RCIB Insurance Volkswagen CC. Neal soon broke free from Plato who had struggled all weekend and set about chasing Moffat. With Moffat defending from Neal, Morgan pulled out a gap at the front. The safety car was deployed briefly on lap 4 to enable marshals to remove a bale that had been knocked onto the track, causing the field to bunch up. As racing resumed, Matt Neal in the Honda Yuasa Racing Civic Type R came under pressure from Jason Plato. Behind the front runners, Inverness based Dave Newsham was involved in a thrilling battle with Gordon Shedden for 9th place with the position changing hands several times. On lap 8, Matt Neal passed Aiden Moffat for 2nd place as Moffat ran wide dropping back into the clutches of Jason Plato. Meanwhile at the front, Adam Morgan had built a significant lead over Matt Neal. Behind Neal, Moffat extended a lead over Plato as Plato was forced to defend his position from Rob Austin in the Exocet AlcoSense Audi A4. On lap 12, Andy Priaulx passed Austin to take 5th place. By lap 16, Jason Plato was losing places while at the front Matt Neal was steadily closing in on race leader Adam Morgan. There was drama in the closing laps when Adam Morgan collected debris which slowed him down. 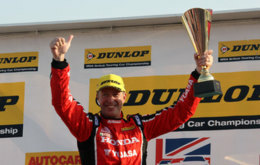 Although the debris subsequently removed itself from Morgan's car, he could not hold off Matt Neal who took the lead. Meanwhile, Andy Priaulx was aggressively challenging Aiden Moffat for 3rd place, finally passing the Dalkeith driver following contact between their cars. At the chequered flag it was a victory for Matt Neal and a second win of the day for Honda Yuasa Racing. Adam Morgan held on for an excellent 2nd place with Andy Priaulx 3rd, just edging Aiden Moffat into 4th ahead of Rob Austin in 5th and Jason Plato in 6th. Aiden Moffat was subsequently promoted to 3rd following a 1 place penalty applied to Andy Priaulx for gaining an unfair advantage during the race. Following a thrilling day of racing, Jason Plato remains at the top of the Drivers' Championship table on 249 points with Gordon Shedden just 11 points behind on 238. Matt Neal is a further 11 points adrift on 227 points in 3rd place with defending BTCC champion Colin Turkington 4th on 221. The Dunlop MSA British Touring Car Championship now heads to Rockingham on September 5th and 6th for the first of a Northamptonshire double header.